It’s been one week since I launched my website and I’m completely overwhelmed by the response that I have had. Not only from the amazing amount of people viewing the site but also by the kind and generous wishes from friends and clients. Thank you all very much. I aim to develop the website along the way not only to inform people about my work but also reflect the very talented musicians that play my instruments. The sound room I hope will always be a work in progress and a platform for players to share and promote their playing and projects. It’s been a big week, but there will be plenty more to come! The great playing of John Wynne from Roscommon Ireland. 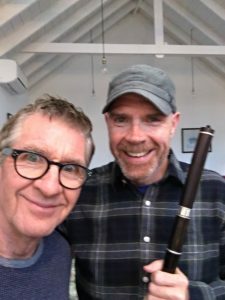 It’s a terrific video of John and some informative chat about flute players in the area. Part of a series HUP STROKESTOWN which features players from Roscommon and neighbouring districts. You will see lots more of this in the sound room. The playing of the very talented Clare player Brian O’Loughlin and friends in another great series of videos. The Riches Of Clare Concert Series. And a very good friend of mine Ian Stewart with his group SENOR CABRALES! Well, it’s fortunate that wind players have good breath control because you wouldn’t have wanted to hold your breath for much longer waiting for this website to arrive! But finally, I’m proud to launch my new webpage! I hope you enjoy it and trust that this is just the beginning. I’m planning to keep it up to date with news and regularly change over the Soundroom videos. A discography is also planned so if you have recorded on any of my instruments and you would like put them up then please email me. I feel very fortunate to have so many of my instruments in the hands of such great players and would love to share this with you!! Shortly I’m hoping to publish some care and maintenance videos such as oiling your instrument, checking for leaks and other tips that may help you out. Hopefully I can build on this but please give me a bit of time I’m very new to all this! Your thoughts and suggestions are very welcome.